Collectors are definitely a subset of the human species. Some collectors are born to it and some acquire the “obsession, mania, passion” (pick your adjective) at a later stage in their lives. I think for myself, I was born to it, but it took a while to kick in. Collecting itself falls into two phrases – the “hunt” and the “kill.” Some collectors get into the hunt and when they get what they were looking for, the object itself loses some intrinsic value to them. Others stress over the hunt and are only satisfied when the object is in their possession. I think I fall more into the latter group. However, that said, I still recognize that collecting would lose its allure if there was nothing of interest left to look for. 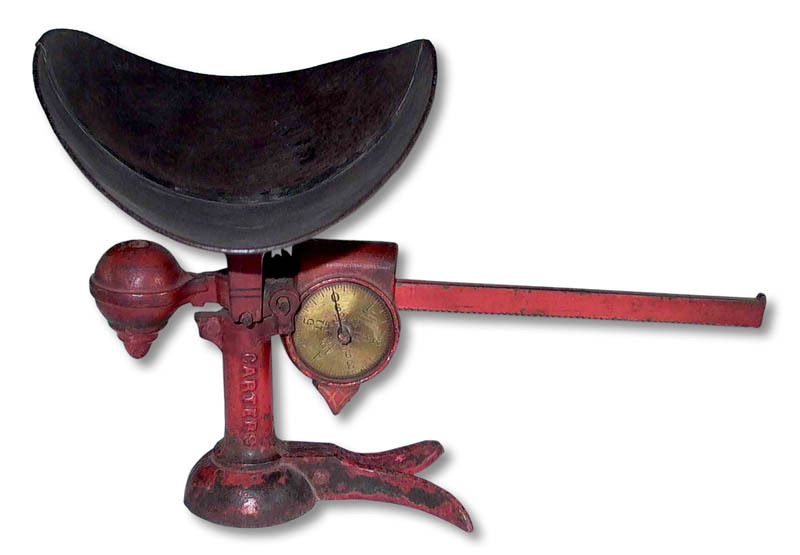 In my early days of collecting, I, like most collectors, bought practically everything I could find related to scales and weights. As I became a more “sophisticated” collector, i.e. started running out of shelf space, I realized I didn’t want every scale in the world, and started to concentrate on the “hunt” for those I really, really coveted. Over the years, as hard as it was to imagine when I first started, I have managed to acquire a great many of the scales I admired in other collections and even a few that I haven’t seen elsewhere. However, there is one scale that has escaped my clutches and the hunt for it continues. I first saw this scale while visiting the ISASC Museum in the spring of 2010. As soon as I saw it, I knew this one was going on my “most-wanted” list. It was about then I was told it is a fairly rare scale, at which point I probably let out an audible groan. As I said, I like the kill more than the hunt! The scale I’m referring to is a Carters Standard. At first glance it appears to be a common counter scale with a typical fishtail base. With a closer look, it quickly becomes apparent there is something very different about this particular counter scale. First of all it has an unusual ice-cream cone shaped counter-weight. 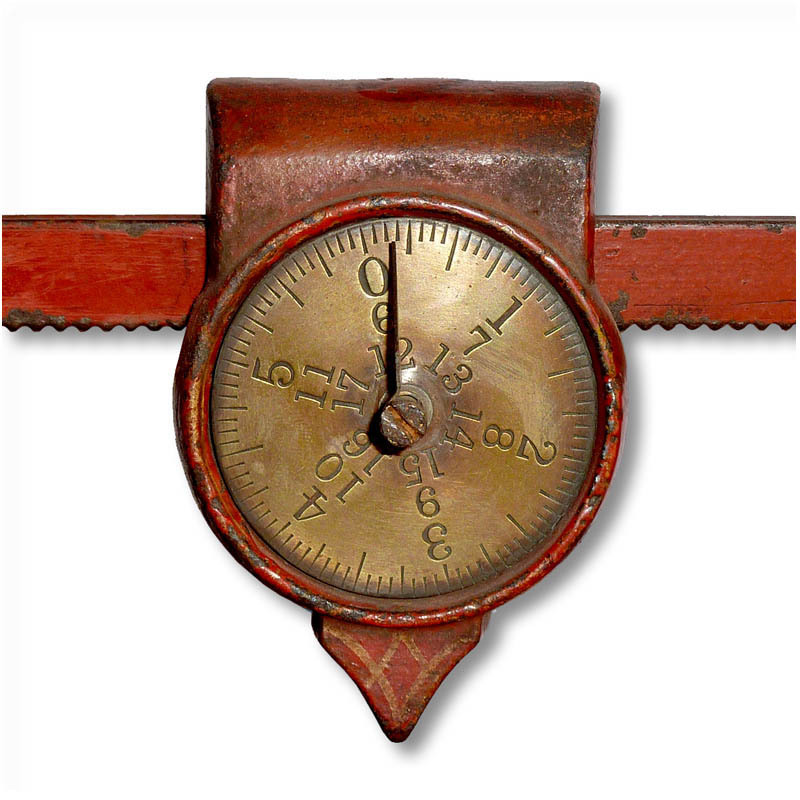 However, what really sets this scale apart from similar steelyard balances is its unique poise. That’s what initially caught my eye! Rather than the normal hanging poise, this one is an unusual shape, attaches to the beam and has a brass face with a dial. 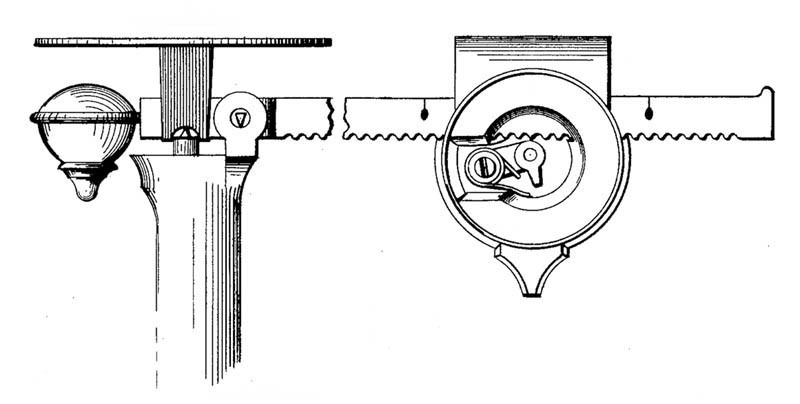 When the poise is moved along the notched beam, the dial on the front of the poise rotates to different numbers to show the weight from 0 to 18. Pounds are indicated by numerals and the ounces by hash marks. The poise has simple internal gearing held against the beam by a coil spring. 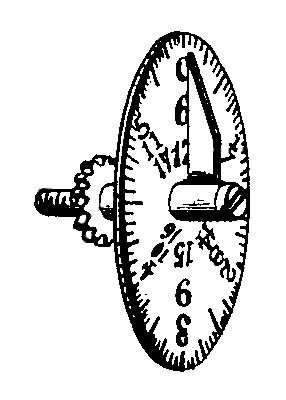 The gearing rotates the dial, not the pointer, which is stationary and does not move. 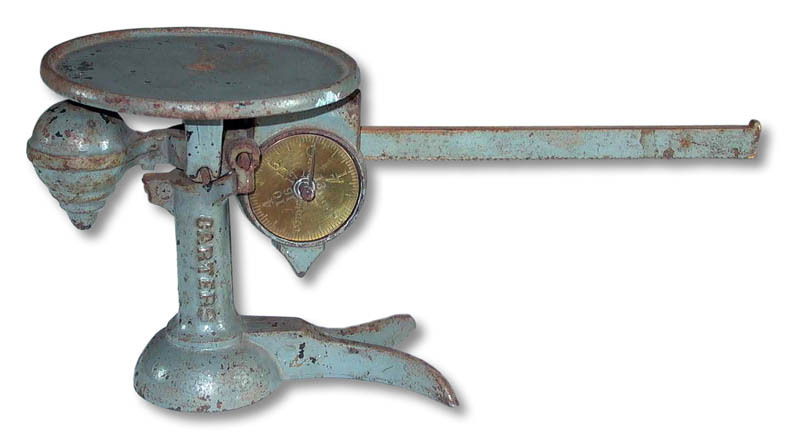 There are two known versions to accommodate the load – one with an ordinary scoop resting on a spider [bracket] and the other with a round flat plate. These years later, I have learned more about this scale, but alas, one has not found a place in my collection. So, I keep looking, and in the meantime, other scales have come my way. Recently, I acquired a scale I had tried to find for nine years. So, in the scheme of things, the time looking for this one doesn’t seem that long. I will continue the search optimistic the “hunt” will ultimately be successful with a Carters taking its rightful place on the shelf joining my other scales. This unshakeable “knowledge,” some might say belief – rational or not – that the one we want will somehow come into our possession is the drive that keeps us collectors doing what we do. Click here to download the Poise For Scale-Beams Patent as a PDF file. This Scale Tale was written by Carol H.